The A400M is the most advanced, proven and certified airlifter available, combining 21st century state-of-the-art technologies to fulfill the current and upcoming Armed Forces’ needs. The A400M combines the capability to carry strategic loads with the ability to deliver even into tactical locations with small and unprepared airstrips. And in addition it acts as a frontline-tanker for other aircraft. 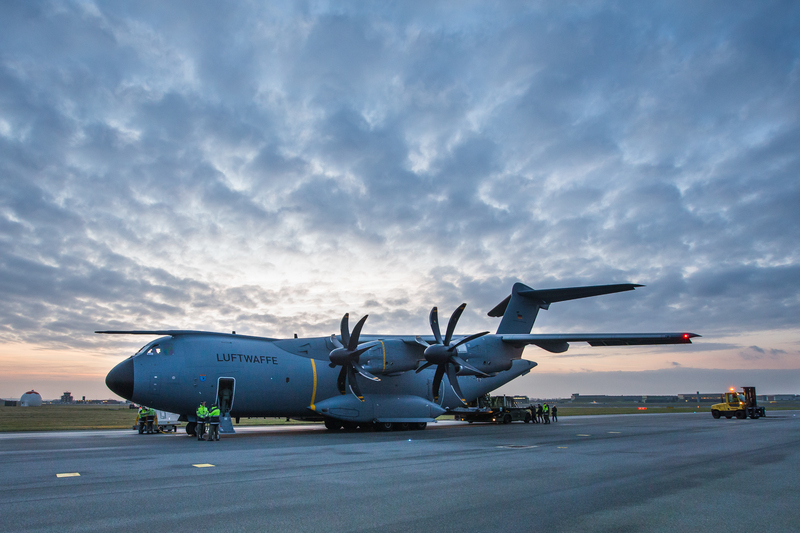 One aircraft, which can do the work of three – The A400M. Lucky enough to have flown on one of these, stunning aircraft with amazing capabilities for such a large beast! How did you get a ride and how was it? I have only seen it flying over my home town in a couple thousand feet. The military airport wich is/will be the home base of all german A400M is just a bit more than half an hour away from where I live. But I might get the chance to get inside one soon. At the June the 9th there is an event in Germany called „Tag der Bundeswehr“ (engl. day of the german Military). On many military bases all over Germany the doors get opened at this day so that everybody can come and see what they do. For example this year the home base of All A400M will be the host for many/all different kind of aircrafts (A400M, Eurofighter, Tornado, Tiger combat helicopter,…) wich will be open to take a look in/at and will perform some Display flights! I‘ll try to make some photos and post them on the forum of possible. I’m serving Royal Air Force Aircrew so I get about a bit and managed to hitch a ride home in one of these after landing away from our home airfield. Ok, yes that might definitely help getting a flight on one of these if you do work for an Air Force wich does have one of those in their fleet 😂. Do you like those flare pictures of aircrafts as well? Should the Airbus A400M „Atlas“ be a future fuel tanker in Infinite Flight? Especially with the A-10 getting a rework? No, I don’t like aerial refueling. For all of you who do wanna get close to an A400M or even have a look inside one. Well there is an opportunity just around the corner at the upcoming Saturday on the german Air Force base of Wunstorf. It’s sad that it has a fairly low range (or maybe I have high standards) and speed but I like the look of it. I wouldn’t say 8700km is a short range. You could fly London to St. Martin non stop and still be able to fly 2100km more. That’s the range with max payload! Sorry, I just came back from a 12 hour trip. Feel kinda light-headed. No aircraft involved. Well, sometimes for realism’s sake, we need max payload. Let’s hope so. I am sure when all those problems got solved the A400M can be an as big success-story as the C160 &C130. I can absolutely recommend it! It’s a very impressive aircraft. You can see some pics I have made myself in June this year when I got to see it up close for the first time just a few posts above! Very interesting! What do you guys think?